Greek rice pudding is a thick and creamy treat — it takes quite a bit of stirring action to thicken properly, but the end result is really worth the effort. It gets its name, rizogalo, from its two main ingredients — rice (rizi) and milk (gala). 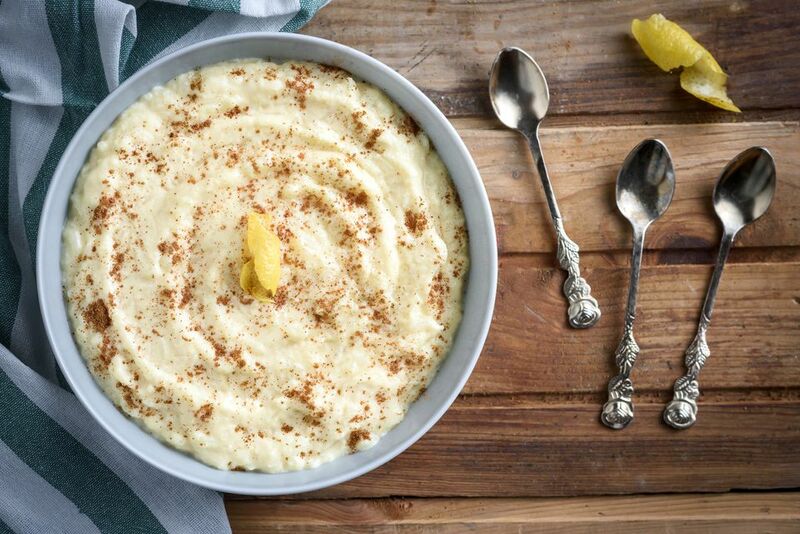 The sweet pudding shows its Greek roots with a hint of citrus from adding a piece of lemon rind when cooking the rice. Rice pudding devotees are quite emphatic about the kind of rice they use. Some cooks believe that there is only one brand of long grain rice you can use. But in general, the best results come from using a short, round grain rice. The Greeks call this pudding rice glace (glah-seh) and it resembles Arborio rice in its appearance. You can try the recipe with both a long and short grain rice and decide which you prefer. Add the milk and pinch of salt and bring to a boil. Add the rice and lemon rind and boil for approximately 25 minutes, stirring frequently to prevent rice from sticking to the bottom of the pot. You want the rice to be tender but not mushy. When the rice is cooked, remove the lemon rind and stir in the sugar. Add about a cup of the warm mixture to the beaten eggs to temper them and prevent them from curdling. Reduce the heat to low and add the egg mixture into the pot, stirring constantly, and continue to cook until the mixture begins to thicken. Remove the pot from the heat, stir in the vanilla extract and cool. To serve, dust with a sprinkle of ground cinnamon. You can enjoy this recipe at room temperature or chilled.